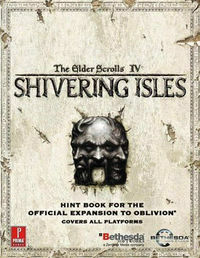 The Elder Scrolls IV: Shivering Isles - Prima Official Game Guide is the official hint book for the Shivering Isles expansion for TES IV: Oblivion, as well as the official plug-ins, written by Peter Olafson and published by Prima Games in 2007. A New Realm, A New Path . . .